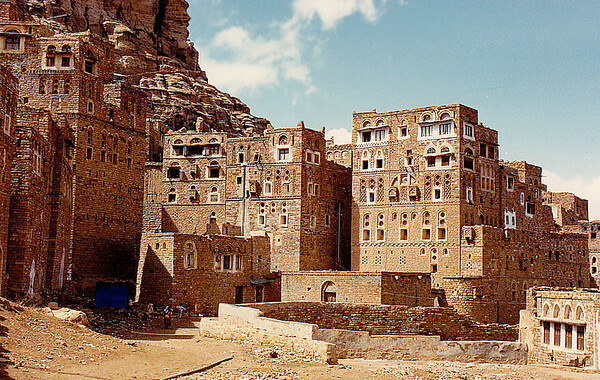 Photos of northern Yemen in the relatively peaceful aftermath of reunification. 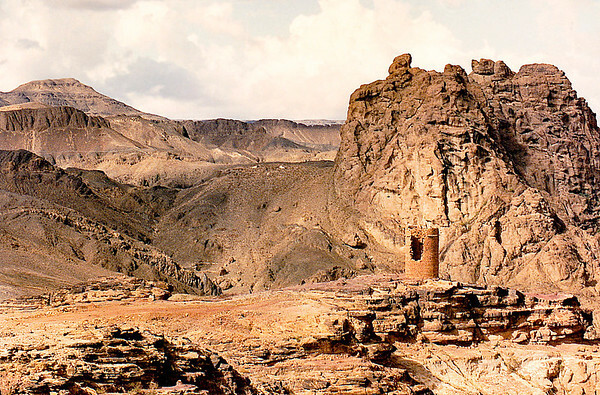 An unusually beautiful landscape housing some of the poorest inhabitants of the Middle East. 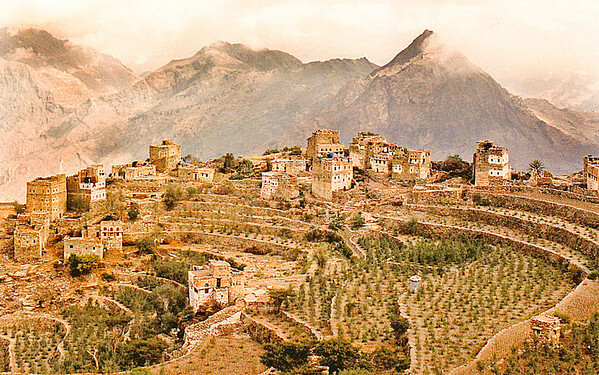 The mountain town of Al Hajarah and its surrounding communal fields; near Manakah, Yemen. Hajarah: A view of the rooftops of village homes, where families gather to eat and gather during the warmer months. 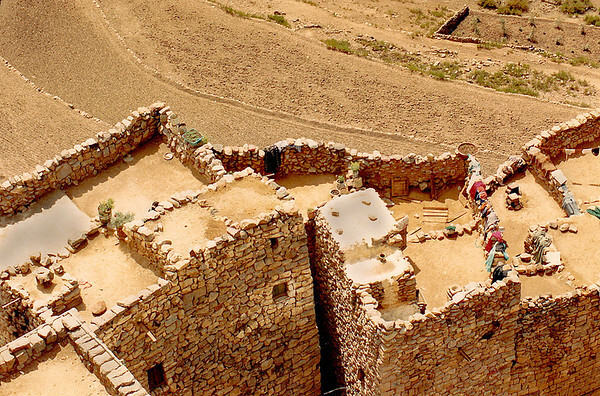 Unmortared masonry buildings of the mountain village of Harajah, northern Yemen. 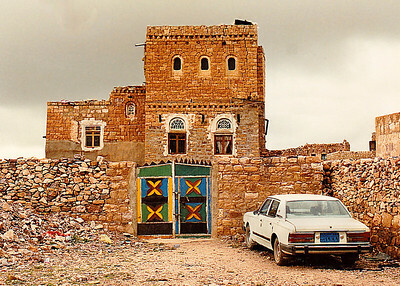 Hajarah: The brightly-colored hand-painted gate and modern sedan parked in front of this traditional home seem incongruous among the uniformly brown and tan colors of the local architecture. 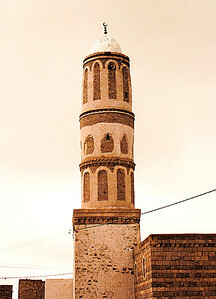 The rough stone minaret of Hajarah's lone mosque. The arched windows of the minaret had to be bricked in to prevent the structure's collapse during the numerous earthquakes that plague this region. 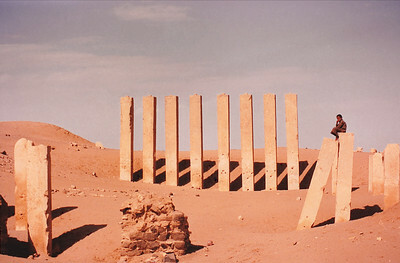 The ruins of the Bilqis Temple, also known as Al Haram Awwam, a Sabean-era structure near Marib, Yemen. Many of the homes in this region have incorporated into their structures huge blocks of masonry and alabaster scavenged from the scores of Sabean ruins, many of which still display inscriptions in the arcane Sabean alphabet. 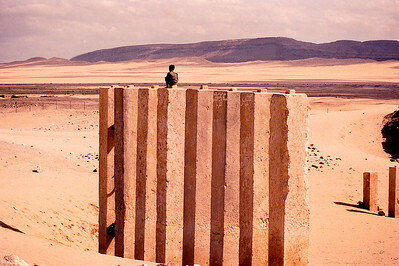 The ruins of the Bilqis Temple, also known locally as "Al Haram Awwam" (as well as the "Pillars of the Moon Temple"), a Sabean-era structure near Marib, northern Yemen. 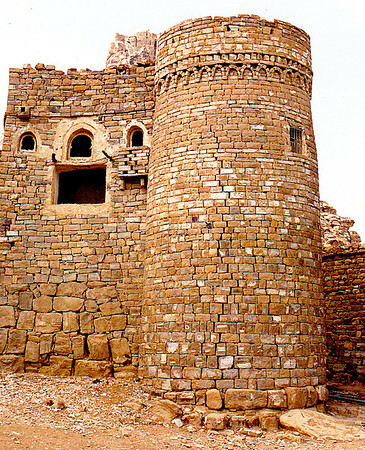 The ruins of the Bilqis Temple, also known as Al Haram Awwam, a Sabean-era structure near Marib, Yemen. 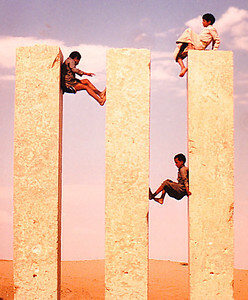 The children of Awwam are fond of shinnying up and down the alabaster-faced columns of the now-vanisherd Sabean temple. 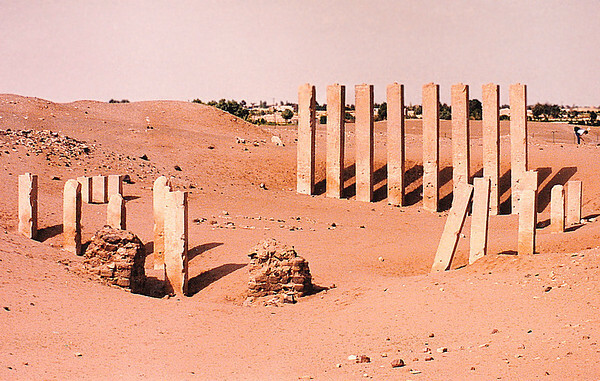 Al Haram Awwam: The square alabaster-faced columns are all that survived of an ancient Sabean temple built during the reign of the Queen of Sheba. Dar al-Hajar: This new stained-glass window and its ornately sculpted plaster of Paris frame were installed by the talented artisan glazier as I watched. 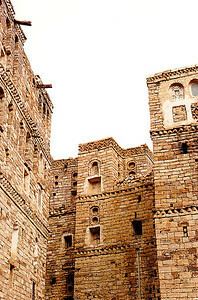 He told me that this architectural art form has been practiced for a couple of centuries in the region that encompasses what is now southern Saudi Arabia and northern Yemen. 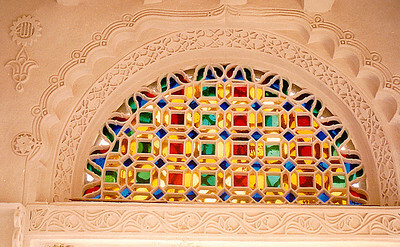 I saw similar windows in homes near Najaran, Saudi Arabia. My driver (man on the left holding the AK 47) poses for the camera with the young boy guarding one of the active archeological excavations outside Awwam. Oddly enough, both weapons belonged to the boy guard! 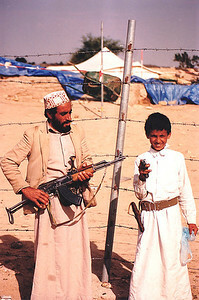 Every male in Yemen seemed to own a hand gun or AK 47 rifle. 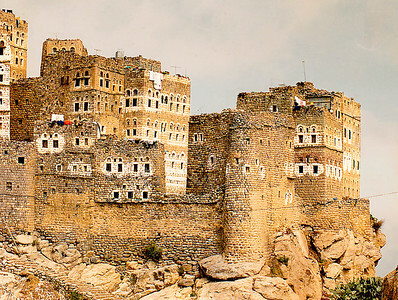 The mountain town of Hajarah is perched on the precipitous heights of a mountaintop in northern Yemen. These houses appear ancient and a bit primitive, but I found that most were fully electrified and had internal plumbing. Many had new vehicles parked outside the high walls of their family compounds. 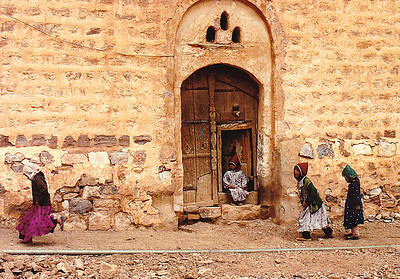 Hajarah: Children playing in the unpaved main road that winds throughout the village. 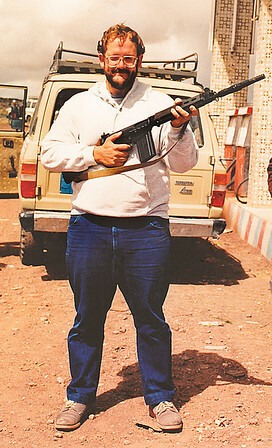 Your intrepid photographer posing with a Browning automatic rifle (lovingly known as a "BAR") loaned to me by a local inhabitant of a village where we stopped to get gas. 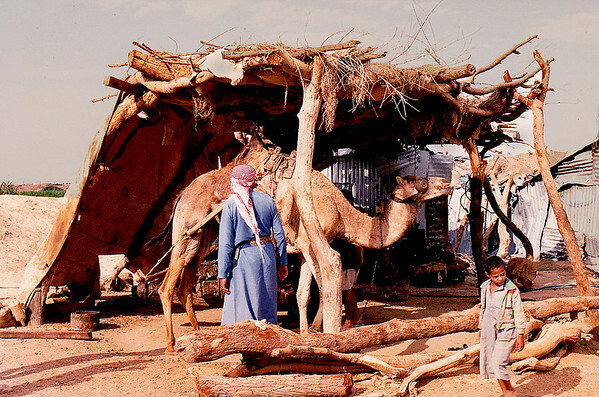 A camel-powered sesame oil mill located on the road to Sana'a. A long-abandoned watch tower built at the summit of a mountain pass by the occupying forces of the Turkish Army prior to WWI. 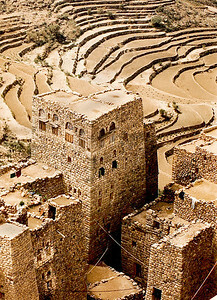 A typical small mountain hamlet in northern Yemen. Unlike most of her playmates, this little girl posed nicely for this candid shot, one of my favorites shot during my long stay in Arabia! 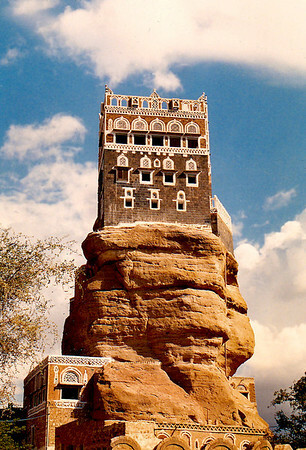 Dar al-Hajar (locally known as "the Rock Palace") is located on top of a rock outcrop (known as a "hoodoo"). 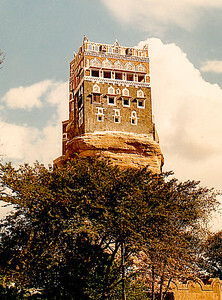 It was built in the 1930s by Imam Yahya as a summer residence. At the time of my visit, it was open to the public while the interior rooms were being renovated and new stained-glass windows were being installed. 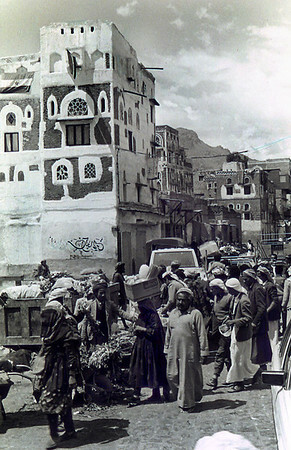 A typical street scene in the Gaddim Bilad ("Old Town") district of Sana'a, the capital of Yemen.